After a seemingly interminable hiatus, Gossip Girl returns next Monday with "The Kids Stay in the Picture," the first of five episodes to close out the show's fourth season. 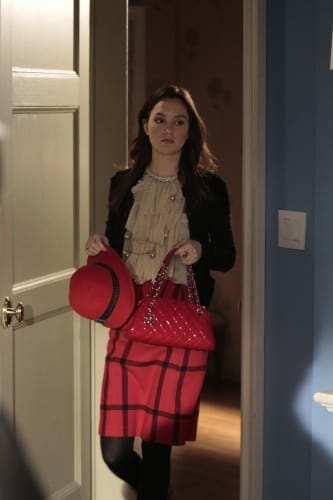 The center of attention this spring: Blair Waldorf. Will her strong, unlikely connection to Dan continue to flourish? Or will her presumed soulmate Chuck Bass win her back? Or, will a royal suitor return to usurp them both? Dan and Blair: Still a going concern or are they totally done? JS: There will absolutely continue to be stories of the two of them together, definitely. All the way up through the finale. And beyond. What about a possible Chuck and Blair reunion? JS: Chuck and Blair are very much connected in this pod. How that connection bears itself out, I just think we've got to wait and see. But the dynamics that have been brewing all season with them. Blair wanting to be powerful, Chuck waiting for her. All of that stuff is definitely very prevalent in these last five episodes. Speaking of Blair's desire to be powerful, has Blair settled on a specific ambition and goal at this point? Does she still want to be a fashion editor? Something presents itself very soon that answers that question. Are we on our way to seeing Princess Blair? Do you think Dan really fell for Blair? Dan will continue to be involved with Blair and in Blair's story. And then he also gets a bit of a new relationship. Is Dan's new relationship with Serena's cousin Charlie (Kalyee Defer)? JS: Wait and see, but I also think something happens regarding Dan's character that has actually been secretly brewing for a long time. It's something that I think will reshape his character. What can we expect for Nate and Vanessa's characters in this last batch of episodes? JS: Nate continues his relationship with Raina (Tika Sumpter), and he's very much folded into that story. And Vanessa tries to get back in the good graces of everybody, and we'll see she'll end of trying larger and larger things until there is one very very big thing that will happen that changes things. With the arrest and the return of William van der Woodsen, there has to be a lot going on with Rufus and Lily's clan, right? JS: Oh tons. [Laughs.] It's always fun when you get all of them together, even when you get any three of those characters together it's fun. We're starting this - episode 18 starts the last five, but it also introduces Charlie, introduces a lot of stuff about the Rhodes family and van der Woodsens that we have never seen or known about before. That's seen through every episode until the end. You constantly learn more and more about Carol (Sheila Kelly), about Charlie, about Lily and Carol's relationship and about CeCe (Caroline Lagerfelt), their mother. It just keeps growing. SS: Aunt Carol in Miami is a character who's mentioned in passing in the pilot. So it was great to meet past aunt Carol two seasons ago and grownup Carol in this episode and to meet her daughter, who is Serena and Eric's cousin. And I assume this all comes back to Serena in the end? Can you expand on how it effects her? JS: The first half of the season was about Serena sort of being gaslit and wondering what it is that she could have done and then discovering that it wasn't her, it was her mother and that fractured them. So we proceeded along looking back at the past at what happened and not, and now this last five are sort of showing how the family comes back together and what this new family dynamic is going to be. That will definitely spin Serena off into a new direction. I think it would be honestly too delicious to spoil. One or another of the actors occasionally says they might be done with the show soon, is there any plan in place to end the show? Do you have an end date in mind? SS: The reality of television life is that the actors have six-year contracts. So any things that the actors have said have been in the context of that lifespan. Which isn't to say that there isn't life of the show beyond that but we're just excited about finishing up season four and hopefully getting a season five, and generally making that the best season of the show that we've ever done. I'm impressed with all that you've done and your stamina in keeping the show so vibrant this far in. SS: Honestly I think I can speak for all the writers, the show is an incredible passion for us and that writing it is a pleasure and we love the characters and the world so much that its really hard to imagine a life without them. And that is pretty sustaining on a daily basis. What do you think? Who will Blair end up with? Dan! Chuck! Prince Louis! Someone else!